© Thomson Reuters Journal Citation Report 2018. 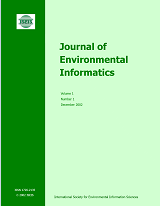 Journal of Environmental Informatics (JEI) is an international, peer-reviewed, and interdisciplinary publication designed to foster innovative research on systems science and information technology for environmental management. The journal aims to motivate and enhance the integration of environmental information and systems analysis to help develop management solutions that are consensus-oriented, risk-informed, scientifically-based and cost-effective.